This camcorder, although a consumer model has many high end features, such as a premium Carl Zeiss Vario-Sonnar® T lens f2.0-3.8 (20x optical and 30x extended zoom). Shooting at this resolution will future proof your videos, as the industry moves toward 4K resolution in TVs. Footage in 4K can also be used for Full HD video production, as you can crop or zoom in on your footage and still maintain Full HD quality. Manual Control (Iris, Shutter, Exposure, and White Balance. 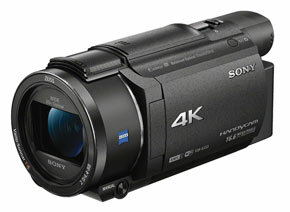 Sony FDR-AX53 Features: The Sony Handycam FDR-AX53 can record Full 4K footage at 24p, and 30p. It can also record Full HD at 60p, 24p, and 30p. The new high quality Carl Zeiss Wide Angle Lens has a 35mm equivalent of 29.8mm – 298mm. Face Detection. A new 1/2.5″ back-illuminated Exmor R CMOS Sensor has pixels that are 1.6x larger for better sensitivity for low light situations. Zoom has been doubled this year to 20x optical zoom. Lock-on AF and face detection will keep your subject in focus. The NightShot® Infrared System can shoot at night or complete darkness. Other features: up to 8.3 megapixel still images, Large 3.0 inch Xtra Fine LCD touch-screen (921K pixels), The new powerful Bionz X image processor allows you to record in 4K Ultra HD, as well as improving battery life. WiFi and NFC to control your camcorder remotely. Compression and Recording: The FDR-AX53 uses the new highly efficient XAVC-S 4K compression format (100Mbps bit rate) to record 4K @ 30p, or (50Mbps bit rate) to record 1080p video at 60p. Records 4K video right in the camera to an SDHC SDXC U3 memory card. Can also record to AVCHD and MP4 codecs for HD. 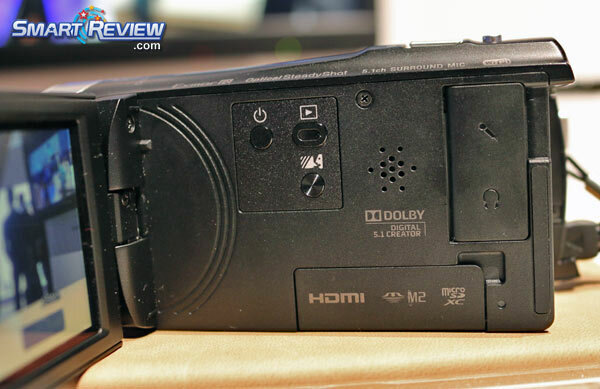 The camcorder does have an internal Dolby 5.1 surround sound microphone (with enhanced audio control), and Linear PCM audio quality. A standard accessory shoe is included for lights, and external microphones. The AX53 also includes an External Microphone Jack and Headphone Jack. Other Features: Tracking Focus follows selected subjects. Hookup to an HDTV or a 4K TV through the built-in HDMI port. USB 2.0 interface. High contrast 0.24″ EVF (Electronic Viewfinder) with 1.55 million dots is provided. Includes a lens hood. Manual Features: Assignable dial provides control of the focus, exposure, white balance, iris, and shutter speed. 31 step Mic level control. FDR-AX53 Battery Life: Approximately 150 minutes recording using the included NP-FV70 battery. Smart-Review Commentary: Sony’s FDR-AX53 is the latest entry in 4K compact camcorders. 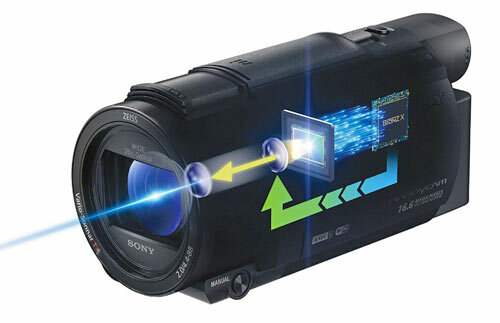 Sony has installed its best Balanced Optical SteadyShot™ (BOSS) into a consumer sized 4K Camcorder. BOSS claims to be 13x better than regular Steadyshot. 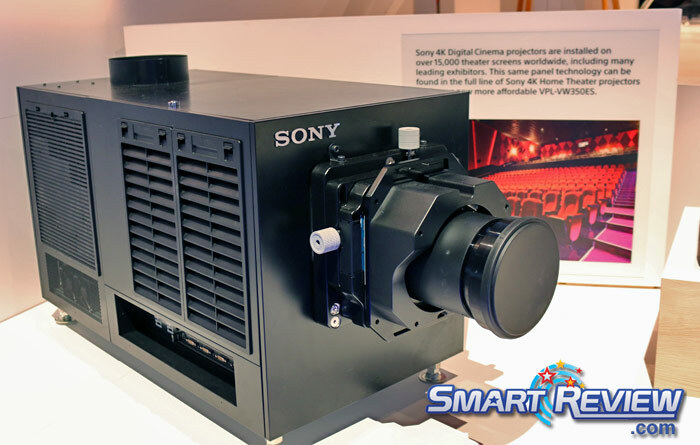 In your hand, you essentially hold a camcorder that is capable of producing video with about the same resolution as a movie theater projector, since most theaters now have 4K Sony Projectors. Shooting at 4K Ultra HD resolution will future proof your videos. 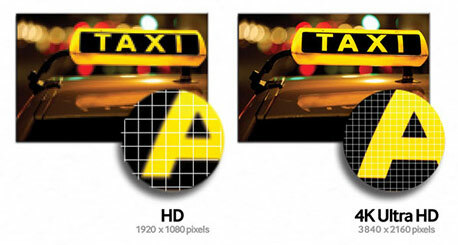 4K has 4 times the pixels of Full HD. Just as we had suggested 7 years ago to buy HD camcorders, we are doing the same with 4K. Eventually 4K TVs will be in most homes, and the video you take today will look great on those TVs, now or in 10 years. Another reason to shoot 4K is that it looks great, even if you convert it to Full HD 1080p. If you shoot in 1080p on this camcorder, it will also have higher quality because it is using the 4K capture to downsample to the 1080p video. And there are many options you have for cropping and zooming in on the 4K video, while still maintaining Full HD quality. The Sony FDR-AX53 has a fast f2.0-3.8 Carl Zeiss lens, and a sensor with larger pixels to help in low situations. It also has an excellent 1.55 million dot OLED EVF Viewfinder for shooting outdoors. The camcorder has an extemely efficient recording codec XAVC-S 4K which records at the highest bitrate in 4K of any Sony consumer camcorder (100Mbps). This assures best quality free of digital artifacts. The camcorder has a nice manual focus ring that can also be used for other manual functions. We have previewed the footage taken by this camcorder and its very clean with no artifacts or imperfections that we could see. This model will carry on into 2019 as no new models were announced at CES. The FDR-AX53 has won our BEST of 2019 award for camcorders under $1000. Description: The Sony FDR-AX53 is a compact 4K Camcorder. It has Sony’s best balanced optical image stabilization. The AX53 is capable of 4K Ultra HD up to 30fps and a high 100 Mbps recording bitrate. With clear and crisp video, this model has won SmartReview.com’s BEST of 2019 award for compact 4K camcorders.